Last week I wrote about how around this time of year, the pace of life gets going and it sometimes all feels like too much. This week's theme and topic unintentionally echoed last week's. There are weeks when I sit down to write something for the weekly Slice of Life, and I can think of nothing to write about. And then there are weeks when the abundance of potential blog posts is completely overwhelming, and I can’t get started on a post because there’s simply too much. I can’t focus. This week, I can’t focus. There’s too much. There are culminating activities--Capstone presentations, performance assessments, the Relay for Life that my daughters spend their year working on. There has also been the homecoming of college students and the approach of major birthdays in their lives. (Larkin turns 21 on June 3, and she is chomping at the bit to walk into the local wine store and buy a bottle!) There was a field trip today with 100 students to a somewhat very disorganized convention, (increasing my own anticipation for Larkin's wine-buying legality.) And there have been some important doctor appointments, athletic events, and achievements on the parts of all four of my daughters, as well in my life, too. 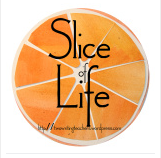 How do I decide what to focus on and write, staying true to the concept of a slice of life? Maybe my slice today needs to spin into and out of the ritual of sitting down in my writing chair, fingers on the keyboard, and deciding what to write, what to share with the community. Maybe my slice needs to include some of the empathy and understanding I have for those students who sometimes just can't get going. As I work with one of our special education teachers to develop a meaningful RTI system for written expression, sitting down and just getting a post out reminds me of how hard writing can be. Sometimes we get bogged down with the volume of word production and the correctness of grammar and conventions when the real challenge is sorting through ideas and just. getting. going. I feel like this should be a post couched in an apology and an excuse for failing to show up to the SOL community for the last few weeks, but here's the deal. You can't do it all. We've had vacations and proms and assessments and reports and college decisions--did you know that April is one tough month for parents of high school seniors who can't make up their mind about where to hang their hats for the next four years? It is. Trust me. Enough about excuses. I have a Slice of Life to write. Today I had the fourth of five science curriculum writing sessions, and we are approaching the gratifying part of the process when we are actually writing lessons. We have an understanding of all the standards, the dimensions, the cross-cutting concepts, and the content students should know and understand, so we can now envision the work that will engage and educate our students on a day to day business. However, I realized as we got going that within the units, even though we were designing them to be inquiry-oriented and student-centered, the keepers of the knowledge were going to be the teachers. I asked the facilitator about this, wondering to him about where students would have the opportunities to set learning goals for themselves and understand what they were expected to learn. Here's the conundrum that we are still working on processing through and figuring out: if we create discovery-based learning opportunities that begin with a phenomenon and a Question Formulation Technique (QFT) or something along those lines, how is it authentic if we are then telling students what they need to know and be able to do once we work our way through the unit. I don't have the answers, and you are all welcome to think about this and comment away. Honesty, I'm not sure there is an answer per se. It's just another wonder about the convergence of important educational concepts involving student agency, inquiry, goal-setting, learning targets, integration, and transference in an information rich environment where teachers are not expected to be the keepers of knowledge but instead the facilitators of acquiring it. Hmmmm. Maybe you can't do it all! Please feel free to brainstorm all of this with me!